How are you? Is it chilly up there? I hope you're staying warm! I'm trying my best, drinking lots of hot coco. Wait! Procrastination isn't bad right? I'm still on the good list right? If so, totally forget I said that, ahaha. Thank you for reading, I hope I'm good enough to deserve it. If not, I'll just bake you cookies, alright? Haven't written to you in a long time (well maybe not as long as I hope but lets just forget about that). I want to believe I've been good this year, but lying would just add more onto the list. Ahem Anyway, this year I would like to receive a Wintry School Uniform. If you could do just that for me, it'd make my year. As for why I'd like it, I just love to dress up that avatar of mine. What can I say, I'm a sucker for cute things. I've been a nice kid this year, although I've probably just about made it onto your nice list. Contrary to my normally lazy lifestyle, I've gone out of my way to help people, I might even be able to say I've become a better person this year. Well, I'm sure I have took up a lot of your time and you have a lot more letters to read other than mine, so I'll wrap it up here. P.S: Say hello to your elven warriors helpers for me. My name is xTet from Raywing Harbor. Hope you are all rested up from your delivering last Christmas. I want you to know that I have been very good this year, I listened to my parents! I graduated college this year too! Now I'm helping my brothers with their homework. I have also helping my dad with our business. This year I would really like an Starlight Mech Wings. I asked my brother if it fits my character and he really liked it to for me and I'm happy about that cuz we have the same taste when it comes to game costumes. Santa I'd like to ask you something... How did you fit in our chimney? or did you use the door? and Do you bring Mrs. Claus with you when you deliver gifts? I wish I can see you and talk to you in person. Thank you for all the great presents you gave me last year. Please tell the elves and Mrs. Claus I said Hello. I would love to see your reindeer fly. PS: Last year you ate all the chocolate chip cookies, so I'll make'em again. How about things in the North Pole, I hope everything is fine with your helpers and your dear Mrs. Claus. I want to tell you that this year I was a good person I have helped those who need it, I have also learned new things in my work and saved lives !!!!!!! I think that if you need my help I will gladly help you . 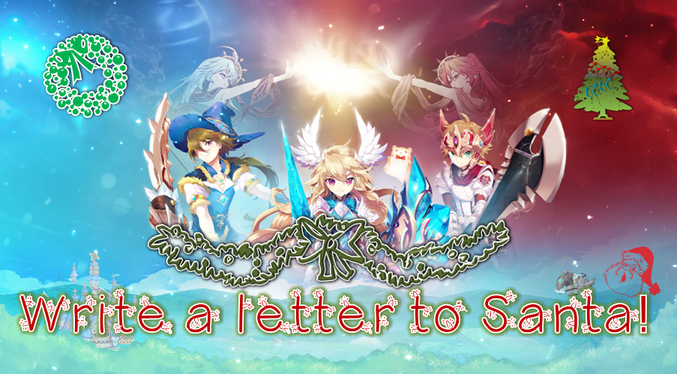 You know this year my wish list is almost fulfilled only missing some things like Christmas dinner and the end of the year but I would also like Alice's Exquisite Outfit so the new year I receive the country of wonders with my dear rabbits I think I have seen in some map (if santa I know I have a fish memory ). Finally Santa for when you get to leave my gift you want something special to eat just ask and you will be fulfilled I have good talent in the kitchen (if I still burn the water but the intention is what counts ), if it hurts you I help you distribute the gifts. Well Santa I retire I hope you can deliver all your gifts and when you finish, go back to my house with Mrs. Claus and we go to the beach to enjoy myself. The post was edited 1 time, last by Dyaz ( Dec 15th 2017 ). This is my first ever letter to you, so I hope I do this right. I will be sending you some home baked cookies with this letter and when you come by on christmas I'll have more with milk ready for you. This year I've been a very good girl, always helping people whenever I can! Friend needed advice? I was there. Someone needed math help? I was there. Someone threw trash on the ground in front of me? I was there to tell them to pick it back up. Also I made sure to pet every cat that would let me and share the beauty of cats with everyone. Now I'm sure you must be very curious of what I want this year, and you must be thinking 'Dis Kjemi...cat obsessed...must be something cat related" and usually you'd be right, but my lovely friends have given me almost everything cat related that I want. So what I ask of you is the beautiful back costume "Seraph's Wings". They are small, blue tinted and very cute! I think someone that loves the colour blue like me would totally rock them. I'll even add a picture so you can see how great I'd look in them! This ended up pretty long, but I hope you don't mind reading I wish you the best of luck getting ready for this busy time of the year. Remember to take a break so you don't hurt yourself. The only thing I want for Christmas this year is a top of the line, custom made Snazzy Chequered Overcoat graciously handed down to me by a falling angelic Deadpool (the angel part can be left out if unable to proceed with that action). That is only item that my heart truly desires this Christmas. I would really like to have this item because not only does it look snazzy, but I would feel great power flowing from inside my body every time I demolish an enemy that the last thing they see is someone stylish looking with a grin on their face knowing they're happy with choices that they have made in life. I also want it because it looks like it would keep me warm and comfortable this winter from the blistering cold. I feel like I deserve this item because I have been such a good boy and 9th knight to Marisa. A few of my good deeds include helping people that asked such as running dungeons, answering questions for new players. I also saved countless lives from the dangerous and unforgivable slaughter of players playing mages in Golden Desert. Watching over my great-grandmother while my grandmother goes out for grocery and other stuff that needs to be done. If you do happen to visit me this Christmas with this bountiful gift, please help yourself to the milk and cookies that will be laid out in a spread of different flavors so you can choose your favorite milk and cookie combination. Don't worry about the leftovers as they will be donated to a shelter. I must say it has been a long time. This Christmas, I would love a costume called cataclysmic crystal wings. This back costume has the benefits of matching with almost every different costume color coordination with its simple color. Its not too big to get in anyone's view or too small to notice. I do deserve this costume because I believe I have done well this year. I have gotten a new job that I very much enjoy. I am continuously working hard and facing new challenges every day. I was able to meet great people in Twin Saga and was even given the chance to work as a Game Sage. I was able to help others out of their struggles and issues the community came across as they adventured through the game. Getting this costume will allow me to enjoy this game even more as I will enjoy looking and create new costume mixes on my character as I play. My name is Tanya, also known as WindChime. I am just a young Mage just dipping my toes into the magical arts, but I am dedicated to my studies and find myself leveling up everyday, but alas, I am a cold, poor, noob mage and I'm so squishy and die often in dungeons. If you could bring me a Cinderella Dress (F) this year, it would strengthen me and give me the encouragement to keep fighting! Besides my magical studies, I have grown in other ways too this year. I'm currently 37 weeks pregnant and I am due sometime around Christmas or New Years! So I hope I won't miss your visit when the baby comes. I know your job is hard, and you want to please everyone this year. I am a tattoo artist, so when a client wants a piece that means a lot to them I try to pour my heart and soul into it, so I can understand how you feel and you don't want to let anyone down. I hope you get to visit me this year! If you come to visit me and I'm at the hospital, can you give my kitty Willow some loving reassurance? She's never met a human baby before so this year is going to be trying on her. She's really fat and jolly too. I hope you and Mrs. Claus have a very Merry Christmas this year! PS: Sorry for my bad english, i'm learning to write with my parents! I hope this letter won't take too much of your time, knowing you'll probably have a thousand more letters to read through. I'm not exactly sure how to write a propper letter to anyone, because I've never found any particular need to do so, but I've been dying to have this Swanky School Satchel for as long as I can remember, it's a perfect must-have for my adventuring needs so that I can store more goodies that I collect on my way. I might not have always been the most angelic kind, but I hope you see past my few flaws so that I might still be off the naughty list. I am always out there to help anyone requiring assistance afterall! May it be a small cat or another person, I'll always try my best to help out their current situation. Stay safe out there and don't exhaust yourself too much! PS: If you decide to come for a visit, I have freshly baked chocolate chip cookies and ice cold milk to quench your thirst and satisfy your hunger. My name is Amanda, I am 6 and 1/2 years old. I hope you are rested up from delivering all of those presents last year. I have been very very good kid this year, I always listened to my mommy and teachers. Even when it was not fun for me, I always listened because my mommy is the greatest in the whole wide world and I love her so much. This year I would really like a Nebular Pony because I love ponies. When I grow up I want to be a horse racer. My cousin, Sara races horses and she is really amazing at it. She won first place in a big competition. I really want to be like her when I grow up. I really hope you enjoy all of the cookies and milk we have. My mommy helped me make them we spent a long time on them, it was a lot of fun making them. Obviously, I'm really 6 years old guys. Hi Santa, I want to ask. Why am I on the naughty list? I did not make Marisa lose her power. I think you have got the wrong person. I was minding my own business too when Amaris and her underlings started making dungeons. I had to help Marisa and defeat them all repeatedly to get money. Marisa wasn’t funding me for this journey but I need gears and costumes. Do you thing I’m still naughty? In my defense, Amaris destroyed the Celestial scale then Marisa power was scattered across the land and because of it, dungeons spawned everywhere . She should be on the naughty list! So I hope you consider putting me on the nice list. Oh! And because of this Journey , I haven’t had time to go shopping and take care of myself. I almost spent my entire time walking too. So for Christmas I would like to get Blue Astral Wings, a match color with Marisa Groupies,.plus! I can fly when doing some daily errands in many place like Sanctopolis, Cosmic Coast, and etc. I really need that wing so I could help people faster. I am such a good person, right? I hope Ms Claus and you are well this year. I'm sure your both very busy this year. I love the work you do and I want to continue that work myself . Christmas is about giving and I would like to give the cutest outfit the Custom Apline Shepherdess Custome (F) to my couple for Christmas . I've had my eye on it for awhile but can not afford such a gift. If you could make room in your busy schedule provide this gift I'd very thankful . Christmas isn't only about giving it's about the birth of Christ and the shepherds that gathered for the new born have always been some of the cutest figures of my imagination . Twin Saga has given me such cute screens and friendships and I am thankful to be able to play and help my friends. Merry Christmas Santa. May your days be bright and happy. PS I have cookies for you that my friends baked with love. My name is Drake, and i've been a good man. I would like the Astral Lancer's Garb (M), & Astral Lancer's Headwear (M). My favorite class on Twin Saga is the Dragonknight one, and i've always wanted those outfits, since it is the ones displayed on the Dragonknight. Please don't think of me as being greedy, I just don't want to feel incomplete. I hope everything has been well on your side Santa, and tell Rudolph the reindeer I said hello. You should come by sometimes to my Terracottage for some Milk and Cookies. Well words are running short, and I know your a busy man, and have a long list to see who has been naughty or nice. Thank you for taking the time to read this letter. Merry Christmas to you Santa, and happy holidays! This year has been quite eventful, I feel like I've accomplished many things for myself and for others. I am always helping new players who enter the game when they ask, and even giving tips and guides on how to get better. Santa, I know you have been very busy lately so that's why I have set up a little something to help you this Christmas. We've set up a little event to help the elves so they wouldn't feel to overwhelmed in sending out gifts to everyone, Our Guild is sharing cheer amongst ourselves and have even prepared a feast for when you arrive. This Year Santa, like every year I only want one thing, I simply just want my hair cut and styled. To be more specific this year I would like my hairstyle to be "Custom Hyperfrost Hairdo (M)", I seen what you've done with Alfallo's hair and I just simply adore it. I know how well you maintain your beard, so I know my hair will be in good hands. Thank you for taking the time out to read my letter, and I really do hope you enjoy the Feast we have prepared for you when you visit Our Home Traces.